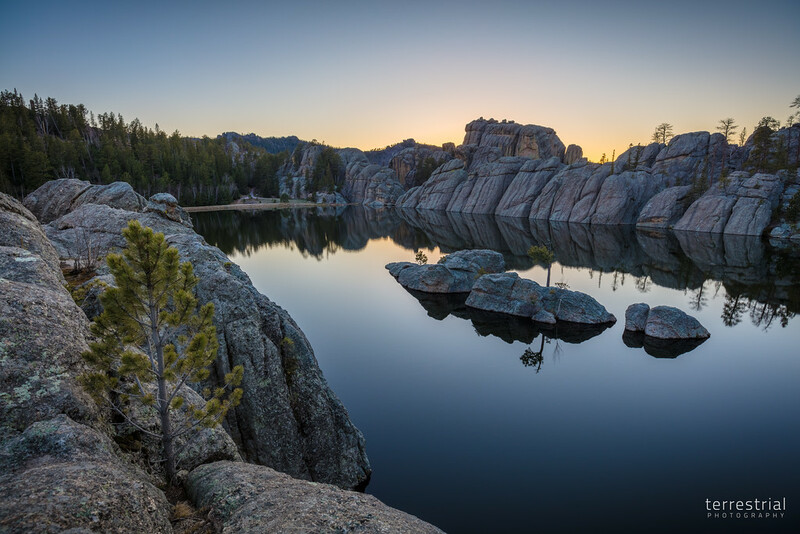 I remember passing Sylvan Lake on my last trip to the Black Hills region of South Dakota in 2013. It was mid-morning and I was in a rush, so I didn't have much time to explore. I made a mental note to return to this unforgettable place in Custer State Park. 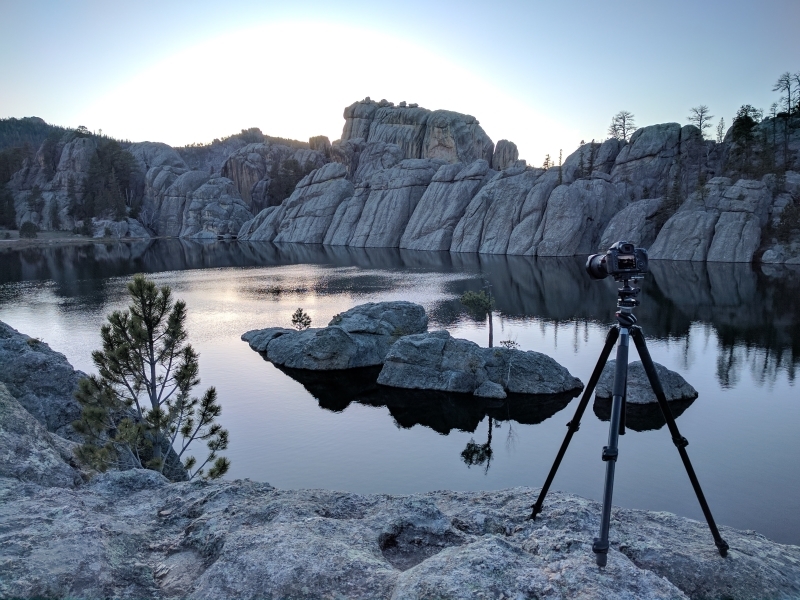 On my recent trip to South Dakota, I returned to Sylvan lake and decided it was worth dedicating sunset to. There were little white clouds dotting the sky, which boded well for a colorful sunset. I scouted the location in the afternoon and imagined what my composition would be. When the time came to return in the evening, I would know right were to go, what lens to use, where my tripod legs would sit, what aperture and ISO I'd use... pre-planning my pictures is something I've been working on over the last year or so. Unfortunately, my weather prediction skills are not quite up to snuff with my picture planning (the lack of cell signal in the area precluded my use of the internet). When I returned in the evening, the little white clouds were all blowing away behind me. With nothing to reflect the sunlight from behind the rocks, the sky would fade from blue to pale yellow, then dark blue as night set in. Past experience taught me that colorless sunsets can ruin a landscape photograph. I contemplated leaving, but decided I wouldn't find a better opportunity before it was too dark to safely navigate the rocks. To make the best of the situation, I used High Dynamic Range (HDR) technique where I captured five otherwise identical images with different exposures. This allows me to combine the exposures during post-processing and preserve details and smooth color tones. The resulting image renders the high-contrast scene similar to the way your eyes and brain see and remember it. Many HDR images appear synthetic, where the colors are over-saturated, the shadows appear brighter than the highlights, and dark halos surround any bright regions of the picture. These are tell-tale signs that HDR was used... poorly. My goal with HDR images is to process them in a way that appears natural. Does it look natural to you? Behind the scenes... This was Google's try at HDR; it's OK but you can see the blown-out highlights. Captured on April 15, 2017 with a Canon EOS 5DS and EF 16-35mm F/4L IS at 16mm and F/6.3.